Located on 10 Edgewater Drive, overlooking the beautiful Coral Gables Waterway that leads into Biscayne Bay, Gables Club has been a staple in luxury living for nearly two decades. 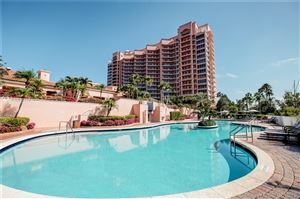 With its excellent waterfront location, gorgeous views, and wide array of amenities, it’s an ideal choice for enjoying the best that the Gables has to offer. This charming condominium is comprised of two buildings: the 18-story Gables Club Tower I, which was built in 1996, and the newer 17-story Gables Club Tower II, which was built in 2004. Each structure is up-to-date and in excellent condition, set amidst the lush greenery and beautiful azure waters of Coral Gables’ bayfront. Each tower offers 99 residences (for a total of 198), although floor plans vary between them. Tower I has residences ranging from 2,570 to 7,900 square feet, reflecting a wide variety of layouts that are anywhere between 2 to 5 bedrooms (with the largest penthouses featuring an impressive 7 bedrooms). The units in Tower II are equally striking, with sizes being anywhere from 1,500 to 10,190 square feet, among the largest condos you’ll find in the area. The number of bedrooms is anywhere from 2 to 6. Aside from the diverse selection of floor plans to choose from, Gables Club residences reflect a high standard of construction and comfort. They offer spacious rooms, fantastic views of the bay and surrounding cityscape, gourmet kitchens with stainless steel appliances, and large balconies. Gables Club offers a great variety of amenities aimed at catering to diverse lifestyles and tastes. Its prime marina is available for sail and motor craft, providing coveted access to Biscayne Bay. Its prominent 15,000 square foot private club includes a gourmet restaurant, full-service fitness center, and a European-style spa. You can also enjoy a swimming pool, lap pool, tennis court, golf green, and jogging trail. Concierge services keep you well connected to many leisure options, while 24-hour manned security provides safety and peace of mind.